Thanks for all your work on these pages! Can you talk about how a Grignard reagent would react with a carboxylate salt, vs. a carboxylic acid? Would they not react? I’m being ask to show the products of a carboxylate salt (ethyl butanoate) and a methyl Grignard followed by a water workup. My guess is the salt and Grignard won’t react (because these salts are pretty stable) and the water will simply protonate forming the carboxylic acid. Thoughts? They tend not to react. Organolithium species do, however; it’s possible to treat a carboxylate with an alkyllithium and obtain a ketone. Your answer sounds right to me. Hi I bought all your guides and the app, but the app isnt updated since 2012, while the chemistry sure hasn’t changed for an orgo course and i dont buy paying, i am, curious if there will be any updates in the future. what does heating grignard reagent with methanol give? It will give an acid-base reaction killing your Grignard. For Grignard reactions, how would you perform the reaction if you have the MgBr-cyclohexane and react it with ethanol then an aqueous acid? Ethanol will just protonate the Grignard, giving you cyclohexane. 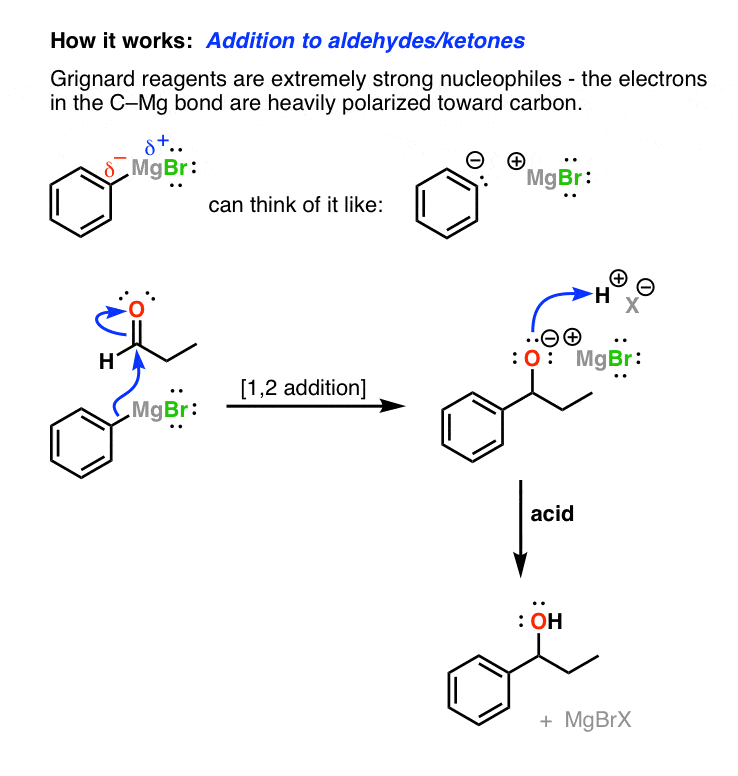 grignards are definitely up their in my list of most favorite reactions. i still think the sandmeyer and clemmensen would win in a fight. Both ketone and ether dont have acidic hydrogen then why does grignard reagent reacts with ketone and not with ether? Can the above reaction occur? 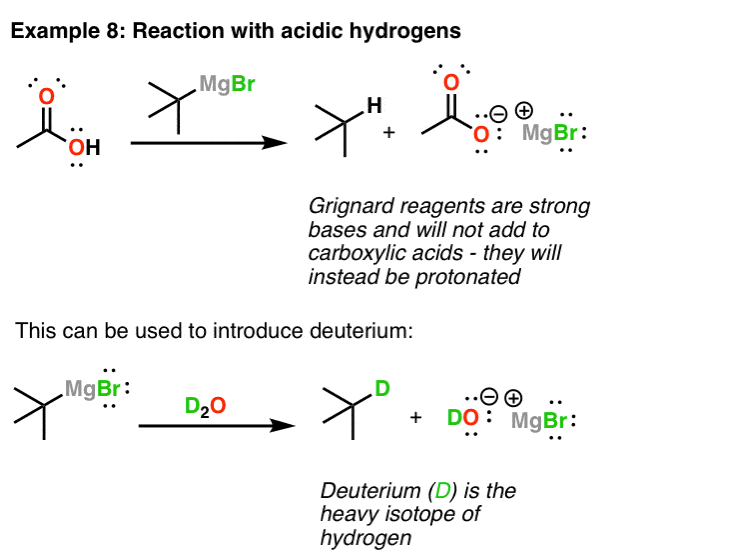 If it occurs then why grignard reagent is put in dry ether? Grignards definitely don’t react with ethers. That’s why they’re used as solvents. As for ketones… you need to re-read this article. What does the X signify in the reaction of the Grignard with carbon dioxide? Is it a hydrogen halide or does any acid work? Hi James, I had a question that’s been on my mind for quite a while since I started taking ochem II. Why is it that we never see Grignards reacting with the alpha hydrogen on ketones and esters and instead opt for attacking the carbonyl in a substitution reaction even though the difference in pKas theoretically allow such a deprotonation to be possible (pKa 50 vs pKa ~20 and 25 respectively)? Hi Jon. Acid base reactions *can* occur but usually only on ketones which have a lot of steric hindrance. Acid-base reactions on heteroatoms like OH are fast because there is very little reorganization of the bonds around the atom after deprotonation. In contrast on an alpha carbon, the carbon has to rehybridize from sp3 to sp2, meaning that the other two C-H bonds have to move as well. Another subtle factor is that an acid-base reaction on the alpha carbon of a ketone requires that the C-H be aligned with the pi system of the carbonyl (so that deprotonation results in a resonance-stabilized anion). So for an acid-base reaction to occur, the collision between the reactants has to coincide with the C-H bond on the alpha carbon being in the right conformation. There is no such conformational barrier for reaction at the C=O bond and assuming that nothing gets in the way of the Grignard on its approach to the carbonyl (i.e. no steric hindrance) the reaction should be fast. I realize this sounds somewhat hand-wavy, but it’s an attempt to backwards rationalize why acid base reactions are relatively slow in this instance. I solved it and came to the conclusion that only 2 moles of CH3MgBr are required but the answer is 3 pls help me ASAP. 1) Look for acidic protons (e.g. alcohols). See any? I do. They’ll perform an acid base reaction. 2) Acid chloride. How many equivalents of Grignard does it react with?